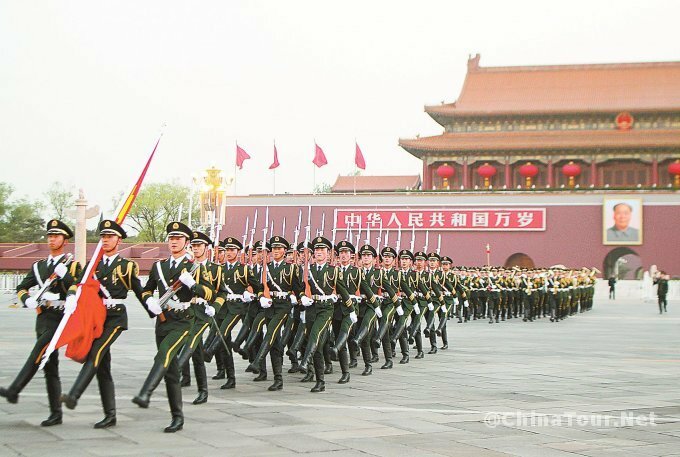 Tian’anmen Square, lies in the center of Beijing, was once the biggest city square in the world. 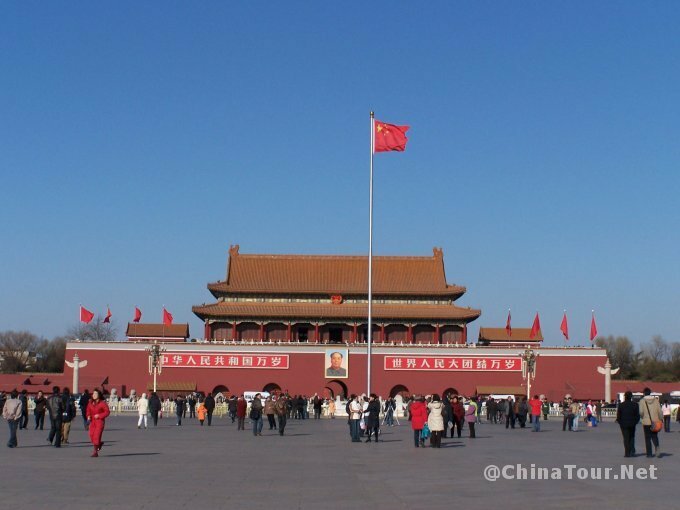 It is 880 meters from north to south, and 500 meters from east to west, with total area of 440,000 square meters and can hold one million people.It was built in Ming Dynasty and at that time common people was not allowed to enter the square. 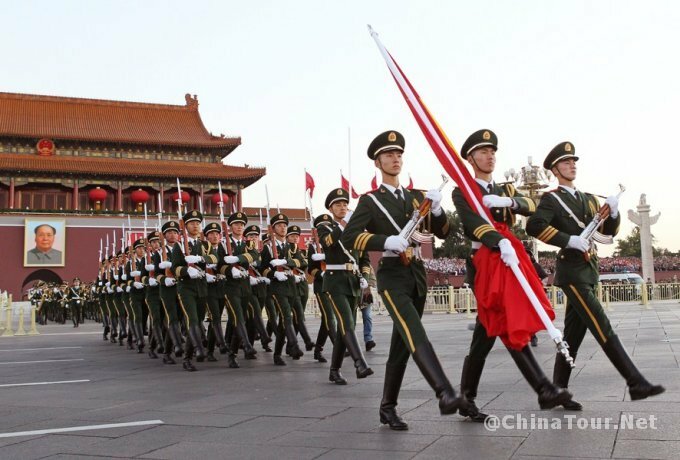 Every morning when the sun rises, there will be a flag-raising ceremony on the square. A lot of people come to the square just for the ceremony early in the morning. 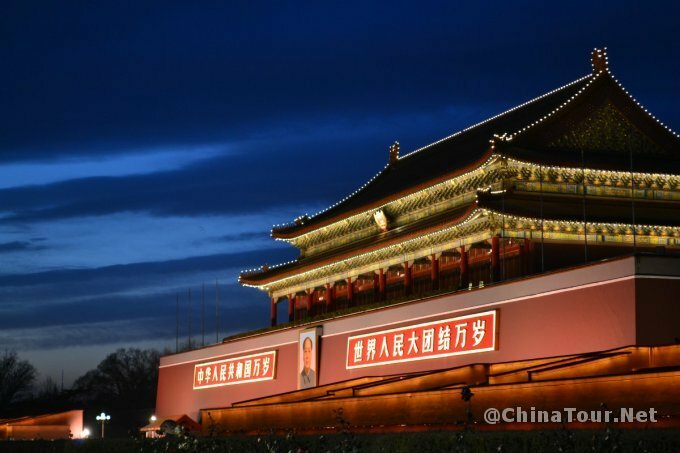 Tian’anmen is not just a square, it is a witness of China’s history. On October 1st,1949, Chairman Mao announced the foundation of People’s Republic of China. It starts a whole new era for China. Thus, this place has a deep connection with Chinese people. Whoever comes to Beijing will mot miss the place. 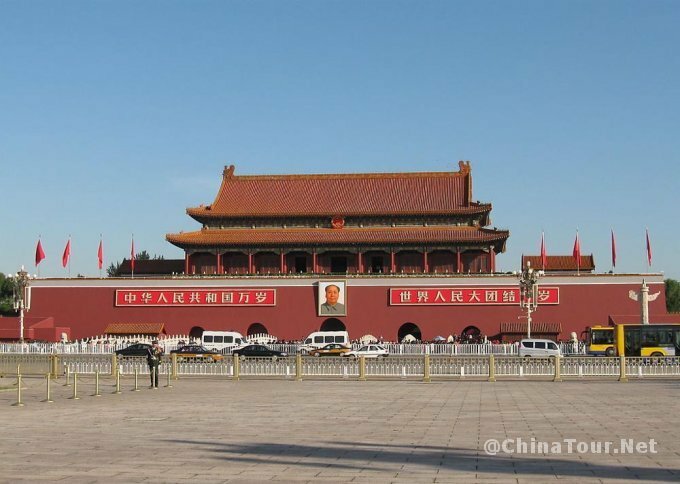 The Tian’anmen Gate was built in Ming Dynasty and it lies to the north of the square. 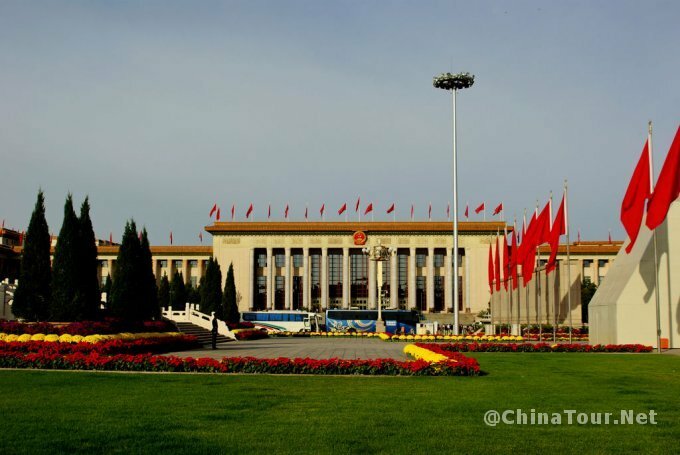 The Monument to the People’s Heroes dominates the center, the Great Hall of the People and the National Museum of China to the west and east of it, as well as The Chairman Mao Memorial Hall and the Qianmen gate, sit in the south of the square. 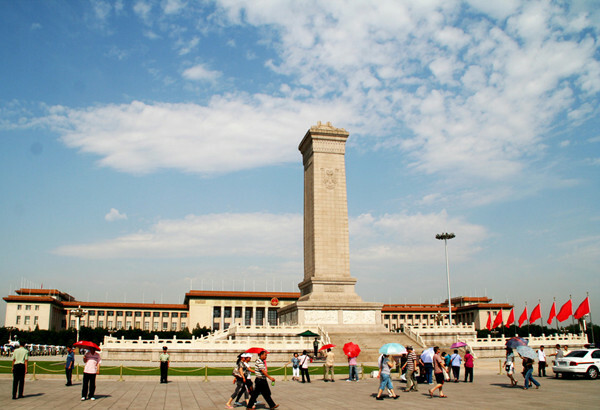 The granite Monument to the People’s Heroes is just at the center of the Tiananmen Square. Built in 1952, it is the largest monument in China’s history. 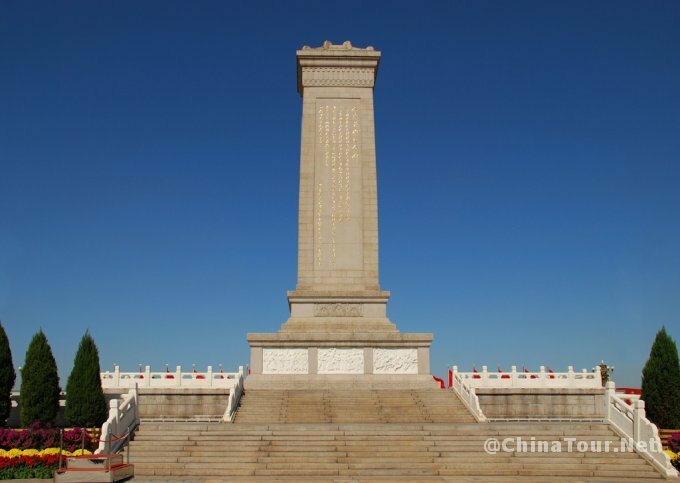 ‘ The People’s Heroes are Immortal’ written by Chairman Mao is engraved on the monument. Eight unusually large relief sculptures show to the people the development of Chinese modern history. Two rows of white marble railings enclose the monument, simple and beautiful. West of the Square is the Great Hall of the People. 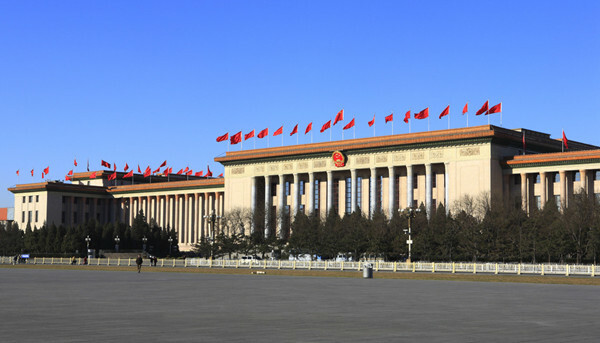 This building, erected in 1959, is the site of the China National People’s Congress meetings and provides an impressive site for other political and diplomatic activities.Twelve marble posts are in front of the Hall which has three parts–the Central Hall, the Great Auditorium and a Banqueting Hall.The floor of the Central Hall is paved with marble and crystal lamps hang from the ceiling. The Great Auditorium behind the Central Hall seats 10,000. The Banqueting Hall is a huge hall with 5,000 seats. Mao Zedong Memorial Hall is at the south side of the Square. 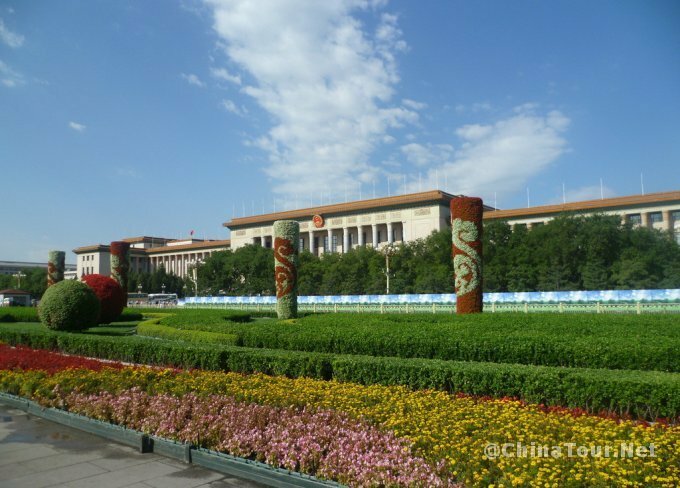 This Hall is divided into three halls and our dear Chairman Mao’s body lies in a crystal coffin in one of the halls surrounded by fresh bouquets of various famous flowers and grasses. 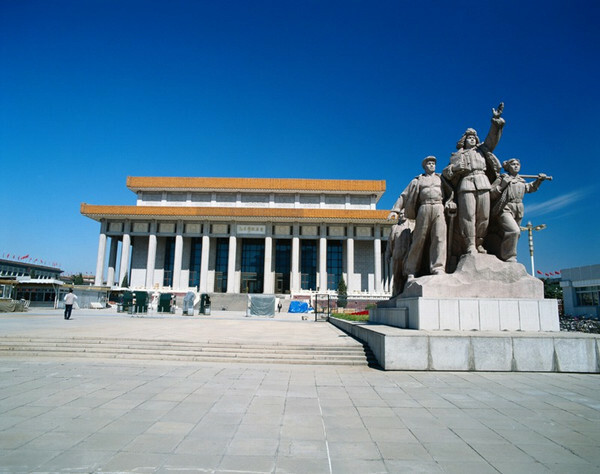 Another important place for the tourist to visit is the China National Museum at the east side of the Square. It just came into existence in 2003 and is a combination of Chinese History Museum and Chinese Revolutionary Museum. 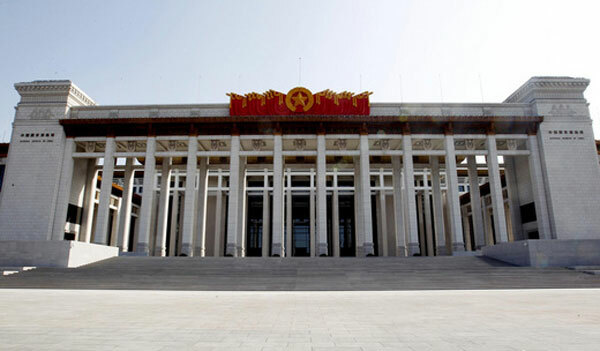 This National Museum faces the Great Hall of the People. Inside the Chinese Revolutionary Museum are a lot of material objects, pictures, books and models to present the development of modern China. The Chinese History Museum shows a large number of cultural relics illustrating the long history and glorious culture of China from 1,700,000 years ago to 1921 when the last emperor left the throne.